We sorted startups building products at the intersection of voice and healthcare by how they are tackling this market. As the next frontier in human-technology interfaces, voice-enabled and voice-first technologies are leading the way in many innovative applications across industries. Predictions that 50 percent of searches will be voice-based by 2020 and that 55 percent of US households will have a smart speaker by 2022 have entrepreneurs, developers, product managers, and marketers rushing to figure out how they can capture the upcoming surge of voice-based technology. In healthcare, voice technology finds a market particularly rife with potential and impactful use cases. The high cost of labor for physicians and other skilled workers - who spent countless hours inputting data into their electronic health records - is one example of an opportunity for startups to disrupt the status quo. In fact, one landscape of B2B voice technology startups across all verticals found that 47.1 percent of companies that were focused on a single sector were focused on healthcare. From "Voice Tech Landscape: 150+ Infrastructure, Horizontal and Vertical Startups Mapped and Analysed", Savina van der Straten, Dec 13, 2017. 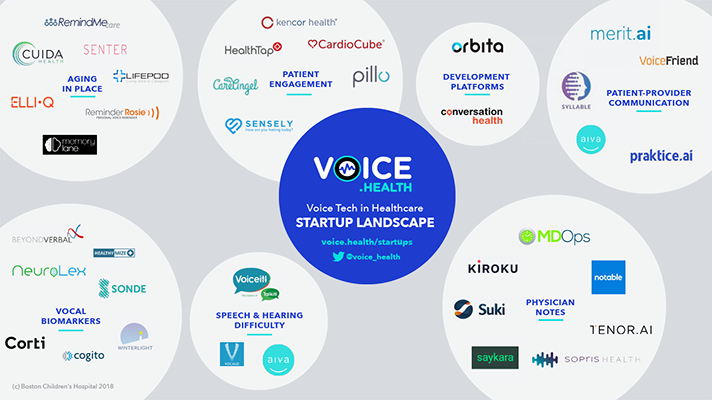 We sorted 37 startups building products at the intersection of voice and healthcare by how they are tackling this market, in hopes of giving those interested in learning more about this exciting frontier an opportunity to check out what voice-based innovations might hit their office, clinic, or home in the next several years. Voice is uniquely positioned to be a valuable tool for seniors who wish to stay in their homes - especially for those who are unable to use other forms of technology that may require mobility, dexterity of the hands, and/or good vision (such as smartphones). These startups take advantage of voice-first technology for seniors. Cuida Health helps seniors connect with family, get access to services, adopt healthy habits, and thrive independently. ElliQ is a proactive AI-driven social robot designed to encourage an active and engaged lifestyle by suggesting activities and making it simple to connect with loved ones. LifePod is a voice-first caregiving service designed to improve the quality of life for caregivers and their loved ones by monitoring and supporting their daily routines. Memory Lane is a way for users to easily recollect their lives, improve their mood, and share stories with family and friends. Reminder Rosie is a simple, hands-free, inexpensive solution to remember your medication, appointments, and every-day tasks. RemindMeCare is a person-centered care, activities and companionship software, available as an app integrated with Alexa. Senter combines the latest IoT and AI technologies with a heavy focus on thoughtful user experience to make the home healthier and safer for aging individuals. Many voice technologies are automating or simplifying communication between patients and providers. Intelligent bots can save clinical staff valuable time and complete tasks - like appointment scheduling and reminders in an outpatient setting, or care team coordination in an inpatient setting. Aiva is a voice-powered care assistant that enables hands-free communication for happier patients and better workflow. Merit.ai uses AI to provide around the clock assistance for scheduling, rescheduling, and cancellation for all appointment types for both new and existing patients. Praktice.ai's virtual hospital assistant not only saves cost with intelligent interactions, but helps doctors and other staff to be more productive, while improving patient experience. Syllable is a chatbot for healthcare that enables engaging, conversational experiences on your website or in your mobile app. VoiceFriend is a simple yet powerful notification solution that enables you to easily keep seniors, staff and families informed of events and important information. Forty-two percent of physicians feel “burned out,” according to Medscape. One of the major causes is the amount of time clinicians inevitably spend behind a computer, entering information from their last patient interaction into their electronic health record (EHR). Several startups are using voice technology as a virtual scribe to enter physician notes into the EHR. Kiroku's sophisticated natural language system can pick up context in a conversation between you and the patient and automatically write your clinical notes for you. MDOps dramatically reduces the documentation time with you dictating and filing clinical notes using your iPhone or iPad, allowing you to spend more time with more patients. Notable uses wearable tech, voice interface, and artificial intelligence to enrich every patient-physician interaction. Saykara is simplifying data capture with a new artificial intelligence-based virtual scribe solution that eliminates the hassle of working with EHRs. Sopris Health is an intelligent clinical operations platform offering a pioneering A.I. medical scribe technology to tackle clinical inefficiencies. Suki is a digital assistant for doctors that starts by helping lift the burden of medical documentation. Tenor.ai is an automated medical scribe that listens to your patient visits via a small microphone in the exam room and creates an accurate patient note in real time. Several startups use voice technology to help improve the lives of those with speech and/or hearing difficulties. Some developers use natural language processing to turn spoken words into text and vice versa. Additional innovations may track disease progression over time using this data, as well. Ava empowers deaf & hard-of-hearing people to a 24/7 accessible life by showing them who says what. VocaliD leverages voicebank and proprietary voice blending technology to create unique vocal personas for any device that turns text into speech. Voiceitt is developing the world's first speech recognition technology designed to understand non-standard speech. These companies make it easy for those who want to develop and publish voice applications, especially if they want to publish across multiple platforms (e.g. Amazon Alexa and Google Home) at once. ConversationHealth creates powerful bots to support the clinical journey of all stakeholders. Orbita is an enterprise-grade platform for creating and maintaining voice-powered healthcare applications, across both voice and chatbot interfaces. Vocal patterns such as pitch, tone, rhythm, volume, and rate can serve as powerful data points - "vocal biomarkers." This information can aid care teams in their diagnosis of a variety of conditions — from cognitive disorders to heart attacks (and many more). BeyondVerbal has developed a technology that extracts various acoustic features from a speaker's voice, in real time, giving insights on personal health condition, wellbeing, and emotional understanding. Cogito improves care management with real-time emotional intelligence. Corti is a digital assistant that leverages deep learning to help medical personnel make critical decisions in the heat of the moment. Healthymize provides personalized speech monitoring based on analysis of patients' voice and breathing during regular voice calls. NeuroLex strives to be the world's leading platform company to advance linguistics as a tool to characterize various health conditions. Sonde is developing a voice-based technology with the potential to transform the way we monitor and diagnose mental and physical health. WinterLight Labs has developed a novel AI technology that can quickly and accurately quantify speech and language patterns to help detect and monitor cognitive and mental diseases. These startups take their voice applications to the patient's home, and use a voice interface to keep patients engaged in their care in between visits with their providers. Many are designed for patients with chronic conditions, to help close gaps in care for the 99 percent of the time that a patient is not in their doctor's office. CardioCube voice-based AI software is an everyday companion to help manage your chronic heart disease. Your healthcare provider in the hospital or clinic gets your disease insights for better and faster decisions. CareAngel is a patient-focused virtual nurse assistant that helps individuals maintain health and well-being to close gaps in care and improve outcomes. HealthTap's Doctor A.I. is a personal Artificial Intelligence-powered “physician” that helps route users to doctor-recommended insights and care immediately. Sensely intelligently connects people with clinical advice and services, enhancing access without compromising empathy. Kencor Health integrates with the latest AI technology to keep your patients engaged in their treatment plan while keeping your team connected to how they are doing. Pillo is the digital health assistant for the home dedicated to the health of you and your loved ones. We look forward to continuing to track the progress of these startups, and others who are sure to form in the coming months and years. Even better, we look forward to exploring their solutions live at the Voice.Health Summit on October 17 in Boston. Learn more about the summit, who will be there (in addition to many of the startups mentioned above), and how you can attend at voice.health/summit. This piece was produced in collaboration with the Boston Children's Hospital Innovation and Digital Health Accelerator, a multi-disciplinary team addressing the unmet needs of patients/families, clinicians, and health systems across the enterprise and around the globe though the power of digital health. Together with the Personal Connected Health Alliance and Modev, they are bringing a first-of-its-kind gathering of technologists, clinicians, innovators and industry together at the Voice.Health Summit in Boston on Oct. 17. The summit is an official co-located event of the Connected Health Conference and will showcase a number of the disruptive startups outlined below in an immersive patient journey experience.